A mountain stage with some small ascents that have had a big impact. 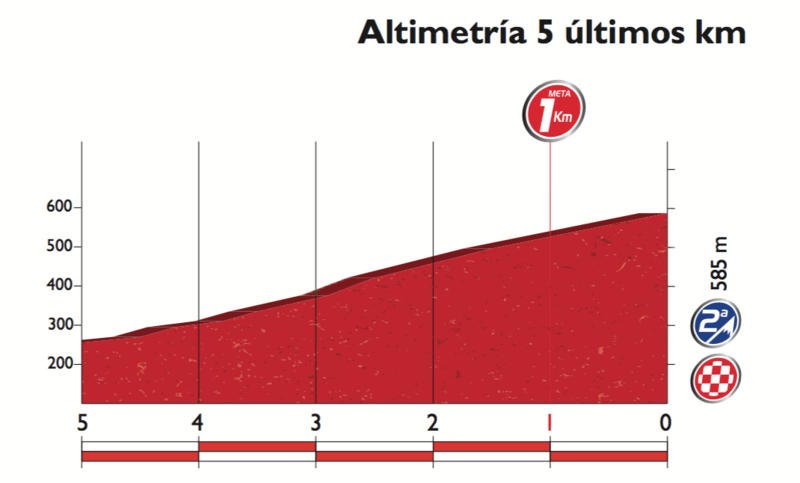 The final climb of the Alto del Naranco was where Chris Horner beat Vincenzo Nibali to win the Vuelta in 2013. Stage 8 Wrap: a stage win for Sergey Lagutin, once upon a time he was the new Yaroslav Popovych, the U23 rider who could win Paris-Roubaix and climb with the best alike only just like “Popo” this promise never translated into matching pro results. A switch from Uzbek to a Russian licence saved his career, it allowed him to became a valuable helper at Rusvelo then Katusha. This time it was Colombian team mate Jhonatan Restrepo who did the team duties, leading up the climb and forcing others to chase. Restrepo may be Colombian but he’s a flatland specialist, a track rider but his efforts at the front might have just made the difference when Lagutin was able to sprint to the line. Behind the GC contenders traded attacks. Contador began the day with questions over whether he’d start and began the stage looking like an Iberian version of an Egyptian mummy such were his bandages. No worries on the final climb as he and Chris Froome and Alberto Contador each had a go, their slow motion attacks indicating just how steep the climb was. Many had selected gearing of 36×32. Finally we got that Quintana attack and it stuck, he was the best of the GC contenders and rode into the overall lead. The Camperona is a deceptive climb, what looks like a small gap can take many seconds to close and once Quintana jumped away it looked like he wasn’t soaring away but in fact he was slowly grinding out an advantage. 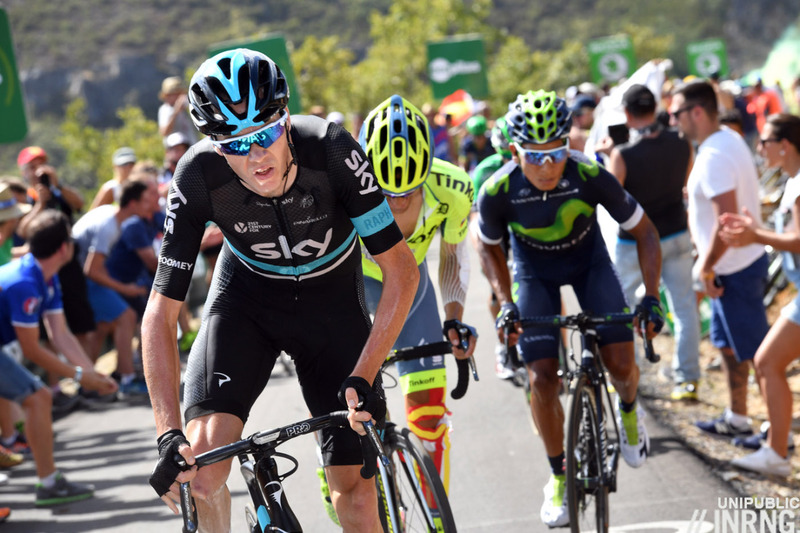 Within the space of a week the race is down to four contenders in Contador, Froome, Valverde and Chaves. 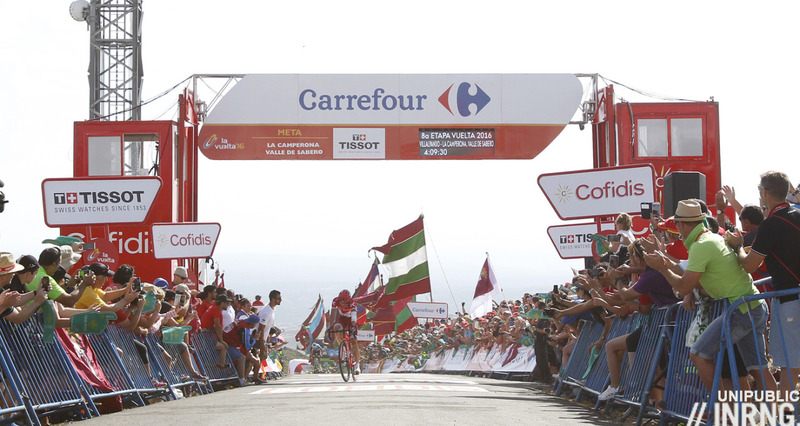 Chaves was the loser on this stage, giving up almost a minute to Quintana. 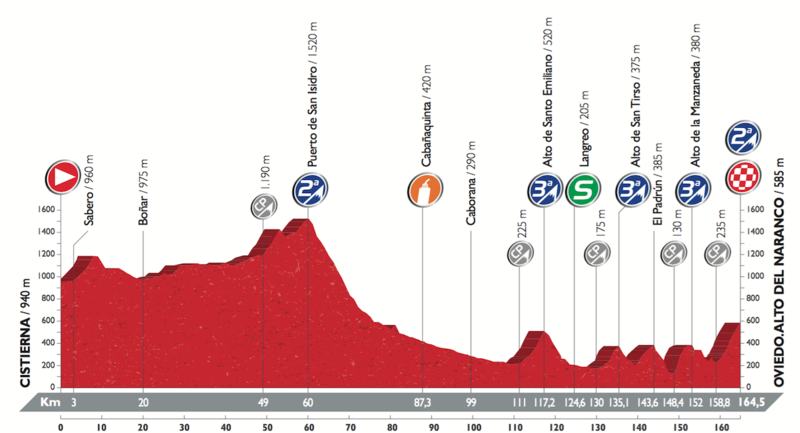 The Route: 164km and 2,685m of vertical gain as the race heads north-west towards Oviedo. A collection of third category climbs line the finish of which the Alto de la Manzaneda is the hardest, 3.6km at 6.9% while the previous climbs are all in the order of 3-4%. The Finish: the Alto del Naranco is listed at 5.7km at 6.1% but once you discount the soft first two kilometres it kicks up to 8% at times before easing to 6% for the final kilometre, an intense effort. Astana’s Luis Leon Sanchez is the versatile pick because he’s proving strong and now that the team have lost their leader Lopez it’s up to the others to help hunt down a stage. Sanchez has won more downhill finishes but is riding well. If not then Andrey Zeits is looking strong. Lotto-Soudal’s Bart de Clerq is in form and hunting for a stage now his chances of a top-10 overall have vanished. He’s solid on shorter finishes like today. For an outside pick there’s Romain Sicard, the Basque rider with Direct Energie was an amateur when he won the pro Subida al Naranco race, the “Climb of the Naranco” so perhaps he’s been waiting for this stage for old time’s sake? Weather: cool and cloudy with a top temperature of 21°C. Hard to say, did Chaves just have a bad day or is something wrong? It’ll be easier to tell after Monday’s summit finish at the Lagos de Covadonga. When you say GC down to four contenders is that because it’s assumed Nairo is riding for ValVerde? Would love to see Sicard do well today. Or the other smiley Sanchez ride into town and win in his own back yard. I know Samu is here as team leader, but is he far enough down to give it a dig. Been watching everything on catch up on Colombian feed. Awesome in the extreme ?? After 60km, is that really a continual 50km-long descent (with a small climb at 80km)? Has made me curious: what is the longest continual descent in grand tour history? Any ideas? Quintana very impressive yesterday. Was surprised to see Contador recover to overtake Froome, although it looked like Froome had blown. A savage climb. Perhaps the descent from Sestriere to the start of Finestre in the 2005 Giro? Froome is beginning to look fatigued, and rightly so. He could be out of the GC at the end of tomorrow. The coverage didn’t really show it but I note that Yates finished on the same time as Chaves. Was the former shepherding the latter, I wonder. Just watched the ITV4 recap and they explained it all. And they pronounced Lagutin’s name correctly. I heard it pronounced a couple of different ways yesterday. Have wondered about the correct pronunciation for some time especially as I have a tt bike of Lagutin’s from his Navigators days. Can you clue us in? Seems almost natural (to an English speaker). Maybe similarity to Agustin tempts folks (when in Spain) to accent the final syllable. Spaseeba. Yesterday’s was an interesting result. I wonder where Froome would have finished had he not tried to burn off Contador, Quintana and Valverde? I think it was a case of him snatching at victory which he really doesn’t need to do. It seems clear that, as in previous years, he will get better as the race goes on and he has something of a get out of jail free card with the ITT in the final days. Common sense would dictate, then, that he ride more conservatively for now and not allow any gaps to open up (assuming he can do this). Instead he tries to gain time, overcooks it and blows losing half a minute to a big rival. You may argue he’s now actually 5 seconds nearer the lead than he was the day before. But its to a much stronger leader. What he needs to do now is stick with Quintana and hope the race comes to him. Which it just might. This is where Movistar are at their strongest, however, when they have something to defend. They are very very good at it, and have the team at this race to give Froome a working over. Which they most certainly will do. I have huge admiration for Contador after putting in that performance yesterday. His body looked smashed up after the fall. Can you imagine getting all that dressing on, sweating profusely during the race in the sun and wind, then having to re-apply it all again afterwards? Weeping sores overnight, then repeat? Ouch. Who are Movistar working for here? I’m not sure I believe that Quintana and Valverde want the same guy to win. Quitea a thrilling climb yesterday, with good slow-motion agony, high difficulty in measuring the effort, and willpower combat. Two things I’d never seen: Froome openly cracking after attacking, and Contador coming back after cracking. More thrills in 2 kilometers than in the whole Tour de France, let’s face it. And today, the little old Naranco, where Rominger beat Zülle in 93. 36 X 32? Wow! Sort of makes my old-geezer low gear of 30 X 30 not seem so low, though I spend a lot more time in that than these boys do in theirs! I’d like to see Quintana win La Vuelta, then make a serious attempt at Le Grande Boucle in 2017 to complete a collection of GT victories. But I also hope Contador and Froome can make him earn the Vuelta win (same with LeTour 2017) so we don’t get a lot of carping about who was there and who was not, who crashed, etc. Its between Contador and Quintana for the overall IMO. Froome beginning to show justified faigue, he will be hunting stage wins before we even get to Aubisque. As for today, put some names in a hat and pick one out.